A VFX system for simulating viscous fluids such as Blood, Oil, Paint, and Ink in UE4. The system is highly customizable and extendable. It includes a decals and materials system for creating pools that grow and dry over time and can create compelling squibs, drips, splats, and streams of blood. GPU particles are used to create the volume for the sprays, while a lower count traditional system mirrors the GPU particles and drives decal placement. A Decal manager for each particle system places the decals based on impact formation from particle collisions. 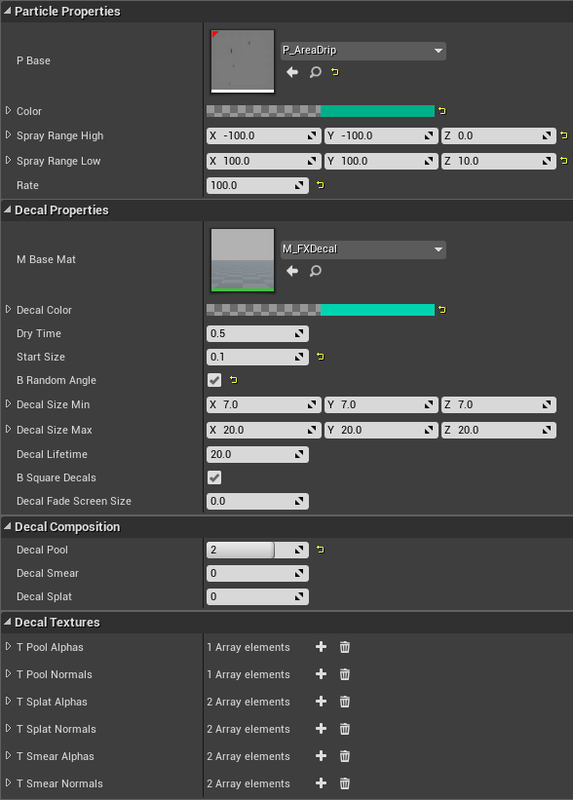 Parameters control the distribution of decal sizes and composition with explicit ratios for pooling, smear, and splat decal varieties.